Tricorn: Production is developed in the UK and is the result of​ many years experience in dealing with the needs of small, medium and large manufacturing businesses. We have designed and continually develop our Job Processing software to be user-friendly, easy to learn, and to give the flexibility needed to manage operations from quotations through to invoicing, enabling you to meet quality, cost, efficiency and delivery targets. Integrated modules provide both management and operational tools and are especially suited to sub-contract, KOP, Kan-Ban, made-for-stock products and "make to order" manufacturing, including assemblies. The comprehensive report generation and search capabilities enable you to continually evaluate performance and improve the efficiency of the total manufacturing process through variance analysis and improved control of lead times, inventory and work in progress. Tricorn's TRICORN:TriTime system enables workshop operators to log-on/off jobs in real-time using rugged barcode scanners providing accurate job costing thereby ensuring you can assess jobs that are losing money. 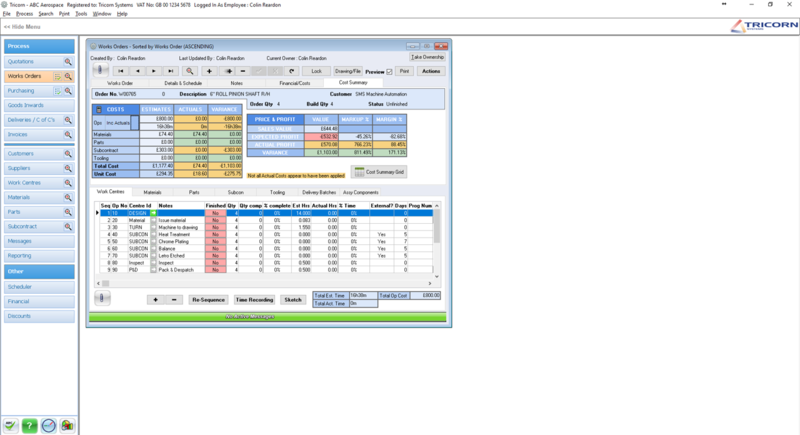 A full cost analysis can be produced for every works order. The system provides a vehicle for quickly responding to customers’ changing demands and for testing "what if" scenarios. Single or multiple quotes - prepare accurate and professionally presented quotes to meet the needs of both you and your customers. Quotes can cover single or multiple items, multiple quantities of the same item, assemblies, KOP and Kan Ban in any combination. Copy quotes - can be used to copy previous quotes, including those that you may have set up as templates. The new quotes can then be modified as required. Printing of quotes - print single or multiple copies of your quotations or, if you prefer, fax or email it to your customer. Quote prints can contain single or multiple items. 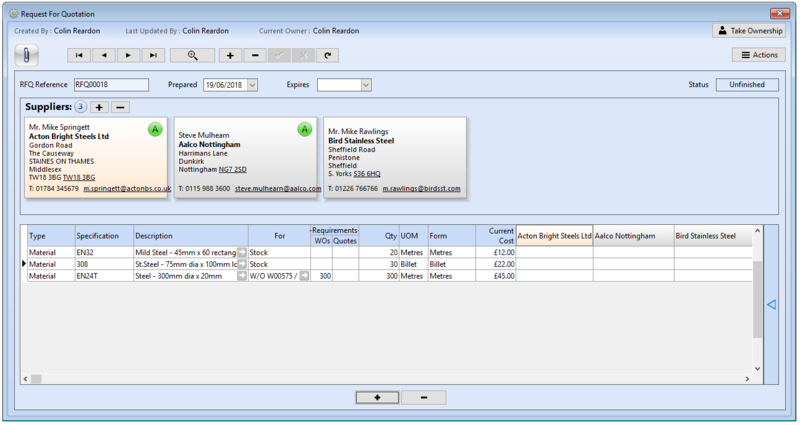 Conversion to works orders - following acceptance by the customer, convert single or multiple quotes to works orders, adding key order information in one easy dialogue. Quote history - use to get reports covering, for example, a history of quoting for a customer, a product, outstanding quotes, accepted or rejected quotes in any combination. If the comprehensive reports do not cover your specific needs, bespoke reports can be written. Order Creation - build works orders to meet your requirements, either directly or from a template, previous works order or conversion from quotations. 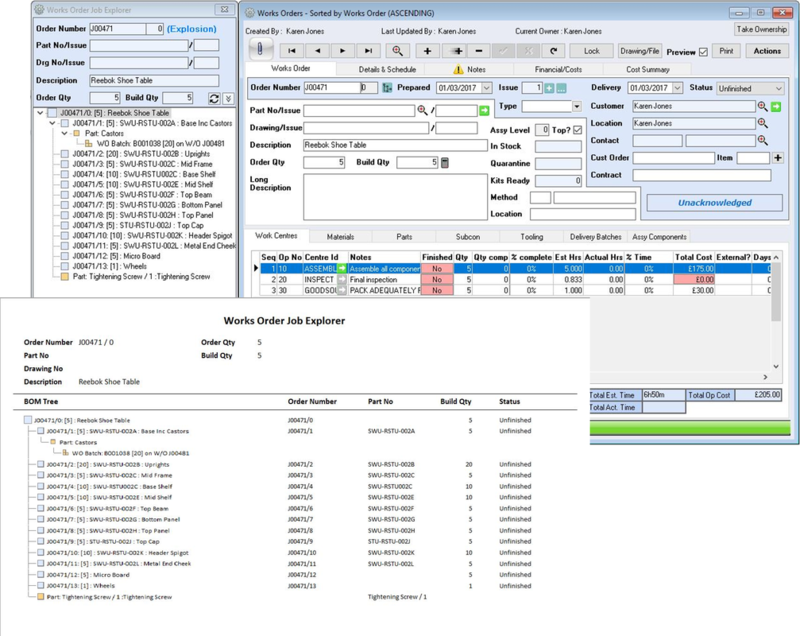 Order Control - work with the components of a works order qualifying the build, material, parts, subcontract and tooling requirements, allocation of stock (manual and automatic) and free issue. Shopfloor Documentation - produce comprehensive shop floor documentation including job cards with digital pictures, travellers and planning sheets, either for single items or assembly work. Time Recording - get times back from the shop floor either by manual data input or automatically via the optional bar code process or touch screens.The times can be used for estimate/actual comparison and to communicate with the scheduling system if installed. Batches - control varying customer delivery requirements, overproduction to stock, open order and build for stock. Release approved batches for delivery / invoicing. Produce labels to accompany the deliveries. Production Control - use the comprehensive reports to monitor and control the sales order book, order acknowledgements, work in progress, assemblies, job history, profitability analysis, work centre loading and scheduling requirements. TRICORN:Production provides accurate and timely costing information that enables you to make informed decisions about production, pricing, process efficiency and more. The system tracks all costs of a manufactured item including raw materials, bought-in parts, labour, machining, outsourced operations (SubCon) and other resources that are directly required to produce that item. Detailed analysis and reporting tools allow you to identify the true costs and profit margins of your operation. Data created or entered in other functional areas of the system is reflected in real-time (via the TRICORN:Dashboard) to allow you to track and report on costs and variances as they occur. Drill down to transaction details to view supporting data from purchasing, inventory, work orders and more. Operation times can be recorded in three ways: Manually by entering the time details from the job card/router; via a Barcode scanner connected to the TRICORN:TriTime module or via a Touchscreen/Tablet using TRICORN:SFDC-e. The Cost Summary tab on the Works Order screen shows the Estimated Cost and builds up the Actual Costs as the job passes through WIP. Projected and Actual Profit is shown and colour-coded to readily identify jobs that are profitable or those that have lost money. TRICORN:Production Plus contains all the functionality of TRICORN:Production and in addition allows for enhanced assembly processing for manufactured components and bought-in parts. The top level of the assembly is defined as "Level 0" and all components and sub-assemblies are linked to the top level. Ratios of components are held in the assembly structure. Job cards for all manufactured components can be printed together. TRICORN:Production Plus works in conjunction with the TRICORN:Scheduler to enable manufacture of components in a planned schedule to achieve completion of the assembly. TRICORN:Production Plus also enables the reservation of manufactured components to other works orders. This is critical in manufacturing businesses where common components are used in multiple finished parts. For example, when raising a quote if you’re unsure of the cost of a material and/or a suitable supplier you can generate an RFQ from the material edit dialog. The Request for Quote can be emailed to multiple suppliers by selecting a supplier from your Supplier Database. Multiple materials and parts can be added to the request. Responses from suppliers can be recorded - even if you decide not to place the order with them. Perhaps a supplier has a lower unit cost but their lead time is too long this time. Purchase Orders can be raised directly from the chosen supplier's response. For works orders - pick specific requirements for the purchase of materials, parts, subcontract and tooling directly from the works orders. Record deliveries against purchase orders with full materials traceability being recorded and print delivery labels. For stock - order materials and parts to replenish stock levels, using the delivery process to record the materials traceability for subsequent use. Ad hoc - order sundries and other non-stock items as required. History - use the history process to analyse your purchases by, for example, supplier or products and outstanding purchases. Raw materials - record the materials used, together with costs, specifications, locations, quantities in stock and quarantined. Facilities exist to search by material description, specification, and batch number, and to see the usage of materials by specific works orders. Control and monitor stock levels. Finished parts - as for materials plus the recording of the ‘owning customer’, when items are stocked that are specific to them. Produce ‘stock lists’ that show the quantities of held parts. When parts recorded are, for example, the result of overproduction, hold the detailed materials traceability of the part build plus print stock labels. Stock history - produce stock reports showing key information such as the value of stock, locations, reorder levels and material batch usage. Specify content - create delivery notes for single or multiple items, selecting the batches for inclusion from approved works order batches. Certificates of conformity – automatically produces certificates showing the ‘build’ of items, if necessary down to the individual items of material, parts, subcontract and tooling that were used. All materials traceability and treatments traceability can be recorded. Document printing - produce quality documentation detailing the items being delivered/certified. Include your own free text notes into these documents. Deliveries to invoice - automatic invoice creation mirroring content of delivery notes for single delivery notes, all delivery notes for one customer or all customers. Monitoring deliveries - reporting facilities monitor can be used to highlight, for example, order delivered and not invoiced, overdue deliveries. Email direct - delivery notes and Certificates of Conformity in PDF format can be emailed directly from within the system to the customer. Invoice creation - build invoices from approved works order batches. Invoices can cover single, multiple items, ad hoc items, specify delivery charges with different VAT, analysis codes and multi currency. Credit notes - produce credit notes as required. Document printing - produce quality documentation to your requirements including pre-printed stationery. Invoices can be configured to include the value in euros at specified conversion rates. 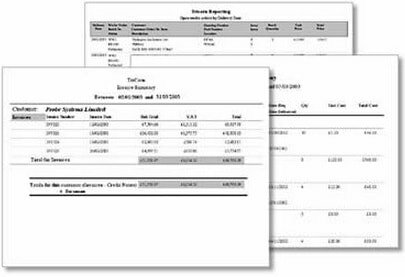 Invoice summaries - produce reports showing values of invoices produced by customer. Email invoices - invoices and credit notes in PDF format can be emailed directly from the system to your customer. TRICORN:Production provides the capability to attach a link to any file in any format to any module within the system. This means that drawings can be attached to parts records and by inheritance they are linked to any quote or works order for that part. Certificates of Conformity for materials or treatments can be attached to the material batch or subcontract activity which are then automatically linked to the relevant works order. Files can also be linked to operations on works orders providing the ability to attach Job Pack files and display on terminals on the factory floor - rather then printing. Tricorn's Production Control system allows you to create warnings and alerts on parts, materials and drawings. If you experience a problem you can now create a warning message so that at any time in the future when the part number, drawing number or material is entered into any screen (Quote, Works Order, Purchase Order etc), a black/yellow bar will appear at the bottom of the screen indicating that warnings exist for the item. Click on the warning bar and details of the alert (or multiple alerts) will appear. The alerts can be managed by an administration screen that allows you to enter the detail of the warning, its severity and - if required - an expiry date, as well as delete out-dated alerts. Tricorn has extensive built-in reports, in addition to a stand-alone end user reporting process, which allows you to write reports to meet specific requirements.